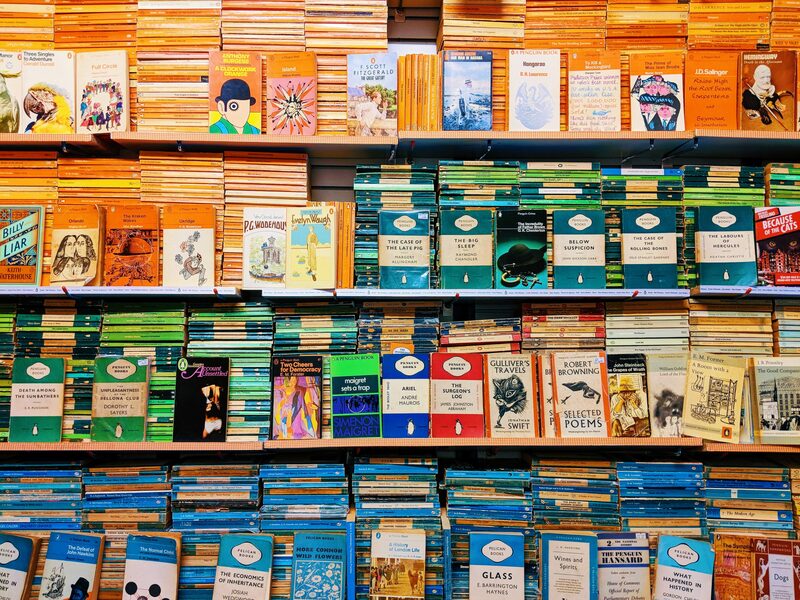 We’ve wanted to visit The Ironbridge Bookshop for ages after hearing about the legendary Penguin book wall (see photo) and chatting with Meg the owner via her Instagram account so last weekend we finally made the trip to this picturesque Shropshire Town. 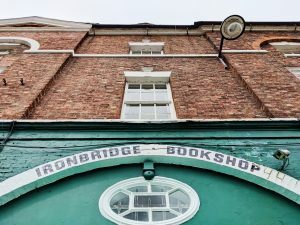 The bookshop is located opposite the famous Iron Bridge which crosses the River Severn. The bridge was covered for renovation when we visited but we didn’t mind as it gave us a good excuse to return! We were warmly welcomed by Meg, who has created the perfect space for bibliophiles. 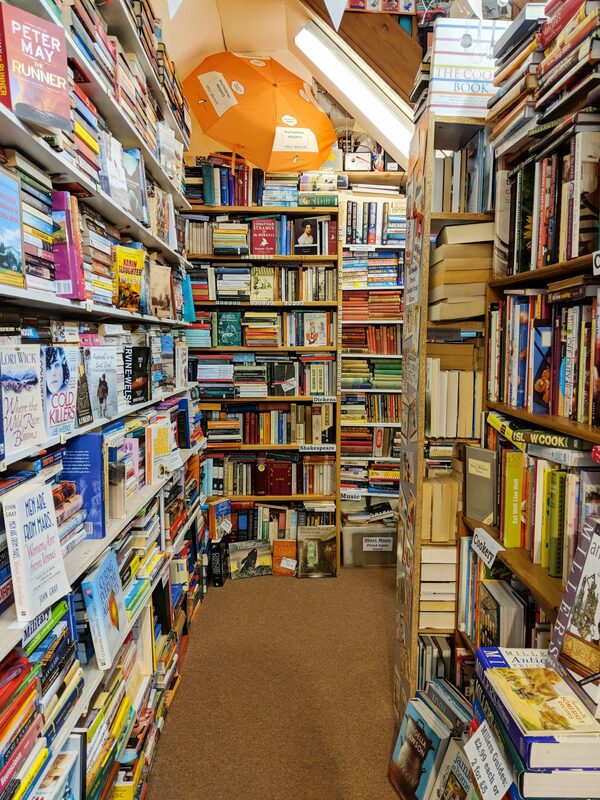 The downstairs room is packed with a staggering array of second-hand books – from classic to contemporary, plus lots of non-fiction including a stack of vintage Observer guides which I passed quickly knowing that I’d want to buy them all if I looked too closely! I’ve been looking for a copy of Terry Pratchett’s Guards! Guards! for ages and luckily found a copy in the sizeable Pratchett section, as well as pretty paperback edition of The Go-Between by LP Hartley. To reach the second room you climb the best bookish stairs ever. I’m afraid I couldn’t get Little M out of posing mode but you get the general gist! The upper room contains the vintage Penguin bookshelves, the children’s area and a small selection of modern collectables such as the Vintage Minis, Penguin Mugs and Journals. Meg also sits upstairs so we had a chat while poring over all the amazing titles. 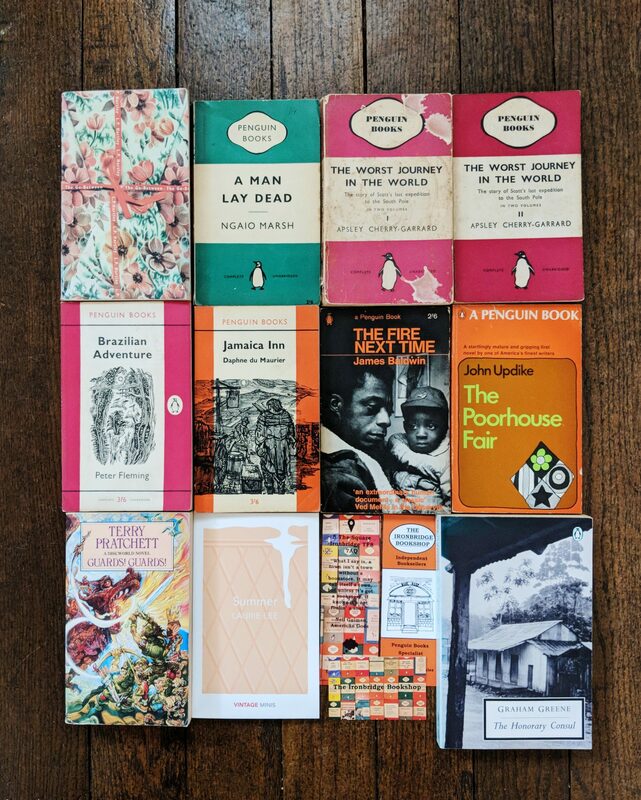 If you love the older Penguin editions, as well as Ladybird books then you HAVE to come here – it is a collector’s feast. While we were having a field day, we were concerned that Little M would get bored. No fear! She made herself right at home. Meg’s prices are very affordable so we ended up buying more than expected and were very, very happy with our book haul. We didn’t have anything particular in mind when we went, but if you would like something specific then Meg will try to source it for you. There’s plenty more to do in Ironbridge if you are staying for more than a day. We didn’t have time to see everything on this visit, but will definitely be returning to the bookshop and the town when the bridge is unveiled. For lunch we ate in the White Hart Pub which is only a few minutes from the bookshop and found the staff friendly, and the food tasty. The Ironbridge Bookshop is open every day of the week 10am to 5pm. You can also follow the store via Instagram,Twitter and Facebook. 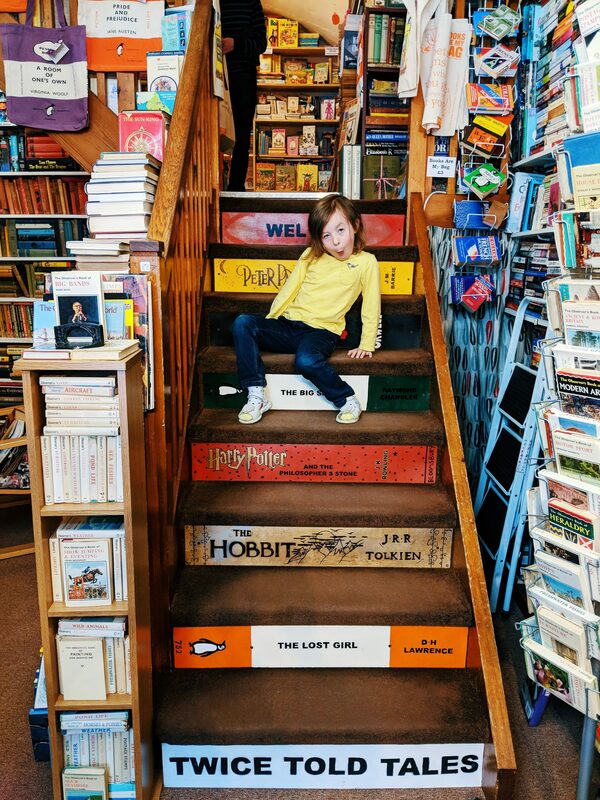 We highly recommend a trip – it is now one of our very favourite bookshops and we thank Meg for making our visit a great one. It looks like heaven! As always, the photos are so bright and fun. Your daughter is absolutely adorable! Thanks for sharing! 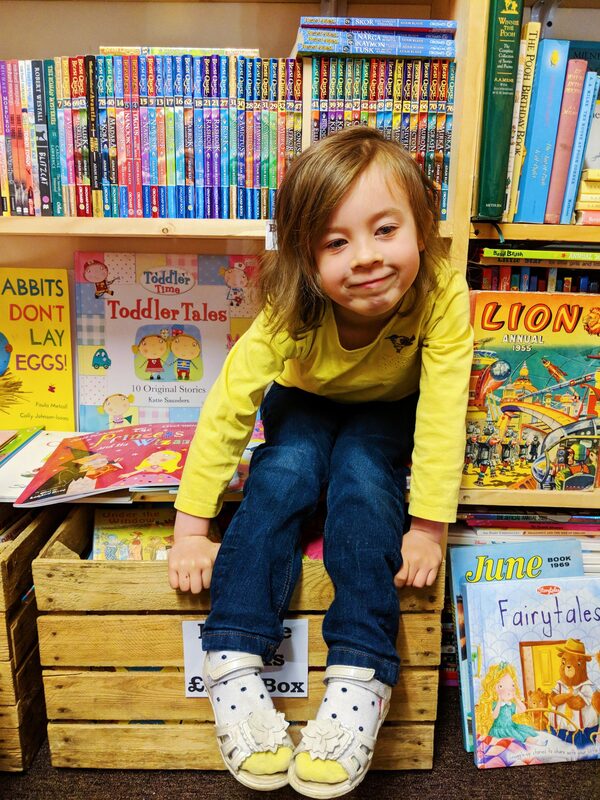 Cramped, with overflowing shelves and walls of collectibles – just my kind of bookshop!